Oh my gosh. As the Kirkman/Adlard Zombie epic ‘The Walking Dead’ rushes breathlessly to the closing stages of its latest story arc, we have 3 future issues to speculate over. At least we know one thing with these future covers – Image are still going to be publishing The Walking Dead beyond the ‘No-one is safe’ arc (as if it was in doubt). Currently at issue 47, with 48 due in the next couple of weeks, we have seen deaths of major characters in a way that is probably unprecedented for a major comic book series. Kirkman is unafraid to challenge readers perceptions of what a comic book delivers. The cliffhanger from issue 47 suggests a shocking denouement to ‘No-one is safe’ that will radically alter the relationship dynamics between the surviving characters, and thrust some of the cast onto the centre stage. It is all very exciting, and I can honestly say that it is the best comic book on the market right now, even better than 100 Bullets or The Exterminators or The Goon. I care about this book, its a monthly(ish) highlight, and when you have spent the 15 minutes or so reading it, you immediately want more. Those readers who just get the trades really miss an important element of the series – the fantastic cliffhangers, followed by the next issue cover printed on the inside back cover, which gives way to the longing for the next issue/fix (can last 3 weeks, can be 2 months, but is always painful in the best possible way). Brilliant – a gatefold cover that really hammers home the peril that Carl is in. 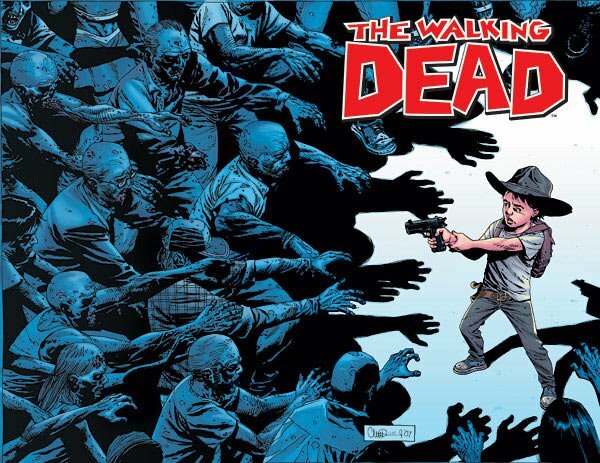 As in the previous issues cover, Kirkman & Adlard are strongly suggesting that Rick Grimes’ young son is going to be the focus of the next few issues at least. He appears to be surrounded and alone, but his posture suggests strength and maturity. He has certainly learned well from his dad on how to hold a pistol correctly, as a wave of the undead bear down on him. Who else would think to put a kid with a pistol on the cover of a ‘mature readers’ comicbook – and get away with it? Zombie attack from the P.O.V. of the soon-to-be-victim. What we can assume from issues 50 & 51 is that the zombies are BACK. Away from the ‘safety behind bars’, we are being assured that regardless of the end of the last story arc, no-one is safe. Whoever belongs to those hands is certainly not safe. The perspective here, seeing the attack from the point of view of the victim, is in marked contrast to the top down view of issue 50, where we have a full view of Carl and can see his determined posture. The perspective shown in issue 51 is another recurring motif of the series – the ‘tease’ cover. 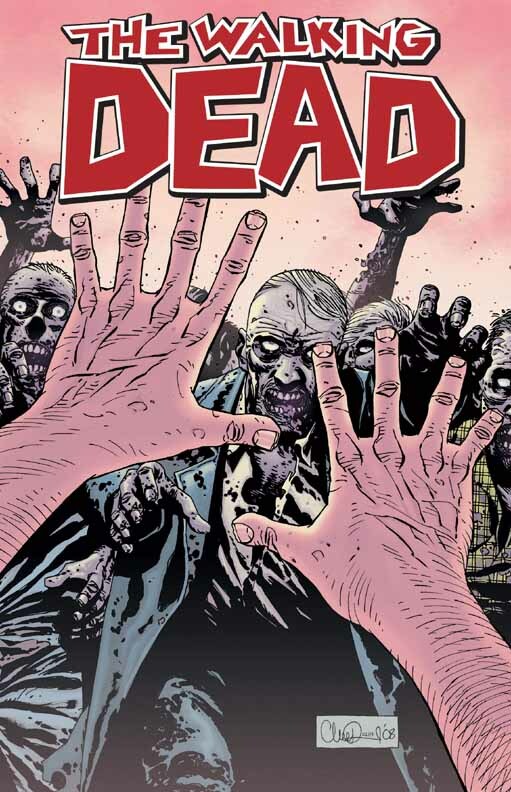 In issue 49, Rick is shown in a shambling Zombie type pose, his face obscured by shadow, the suggestion being he is infected. We are ‘teased’ with the suggestion that the hero is with us, but in a radically altered way. With issue 51 we know that someone is about to be devoured by the undead, but who is it? The fact there are two hands outstretched in a defensive pose certainly rules out Rick……. Probably the most intriguing and thrilling of all three of the covers. We can now assume that Carl survives the onslaught from issue 50…. 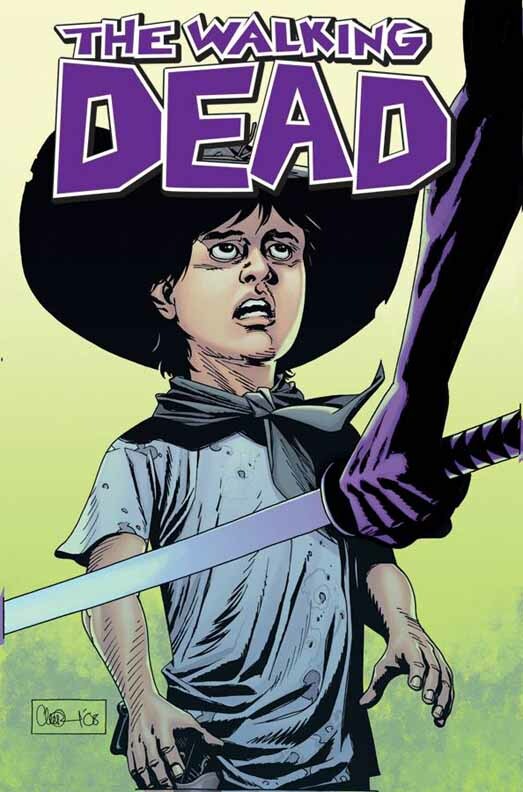 Apart from that, what I love about this cover is the tease – it looks like the Katana that belongs to Michonne, and whoever is holding it looks to be threatening Carl (the tightly clenched fist around the Katanas handle, the way the blade seems to be raised towards the young boy). Who could it be? The Governer? Michonne? If it’s Michonne, why would she be threatening Carl? You can see Rick Grimes son put his hand over his gun, but the facial expression, though one of surprise, is not one of fear…. So many questions. These covers, superbly rendered by Ardlard, pose as many questions as the clues they give us to what could be happening in the future. With Kirkman seemingly on top of things with publishing deadlines on this series, we should find the answers to all these things and more in the next few months.